Imagine dining surrounded by the stars of British Superbikes, before witnessing Steve Hislop officially receive the championship trophy. A limited number of tickets are available for the BSB 2002 Awards Presentation Dinner, an exclusive black tie event with personalities including Hislop, Michael Rutter and Sean Emmett. You’ll also get the riders from the other Supersport and the other support races, a three-course meal, live music and a disco. 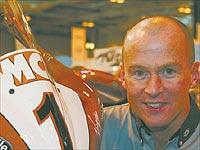 Stars line up for MCN Live!